In the beginning—2009–Todd Bol of Hudson, Wisconsin, built a model of a one room schoolhouse as a tribute to his mother, a former school teacher who loved reading. He filled it with books and put it on a post in his front yard. His neighbors and friends loved it. He built several more and gave them away. Each one had a sign that said FREE BOOKS. Rick Brooks, of the University of Wisconsin-Madison, saw Bol’s do-it-yourself project while they were discussing potential social enterprises. Together, the two saw opportunities to achieve a wide variety of goals for the common good. Each brought different skills to the effort, Bol as a creative craftsman experienced with innovative enterprise models and Brooks as a youth and community development educator with a background in social marketing. Recently I arranged with the co-owners of City Feed & Supply, one of the wonderful, socially conscious businesses in my Boston neighborhood of Jamaica Plain, to place a Little Free Library in their Boylston Street store. City Feed is a popular neighborhood gathering spot, offering a variety of coffee drinks, freshly-made sandwiches, and health-minded groceries, and I thought it would be a perfect home for a Little Free Library. I took a snapshot of the first collection of books to be included in the box. I also posted announcements to some of the J.P. online bulletin boards and Facebook pages. In less than a week, it’s already attracting some reader traffic! Of course, I must confess my ulterior motives in promoting this idea. I have way too many books, and being able to share some of them with others helps me to thin the herd. I could spend most of the next ten years simply reading the books I’ve accumulated and still not get through them all. 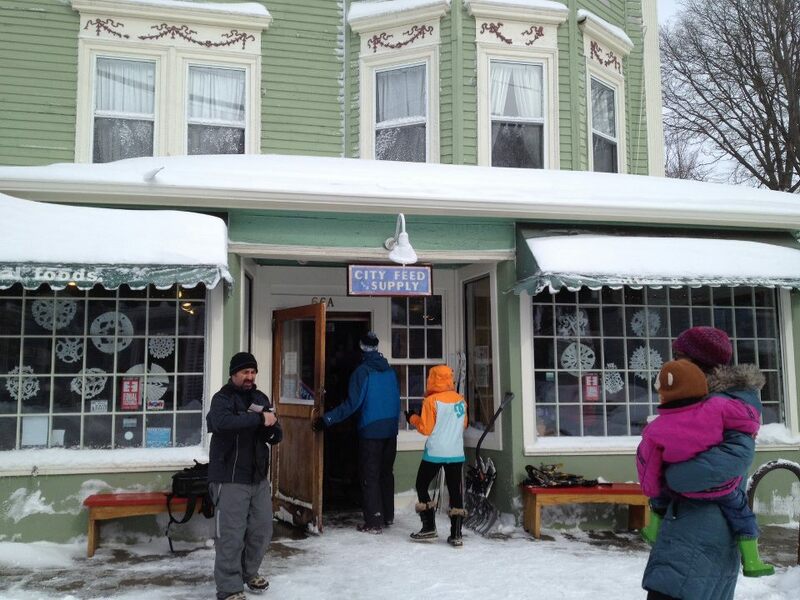 I forgot to take a new exterior shot of City Feed to go with the photo above, but here’s a scene from two winters ago. It’s a fitting view. After all, as the weather grows colder, the temptation to curl up with a good book, a cup of coffee, and a nice little morsel will be all the greater! Good for you! 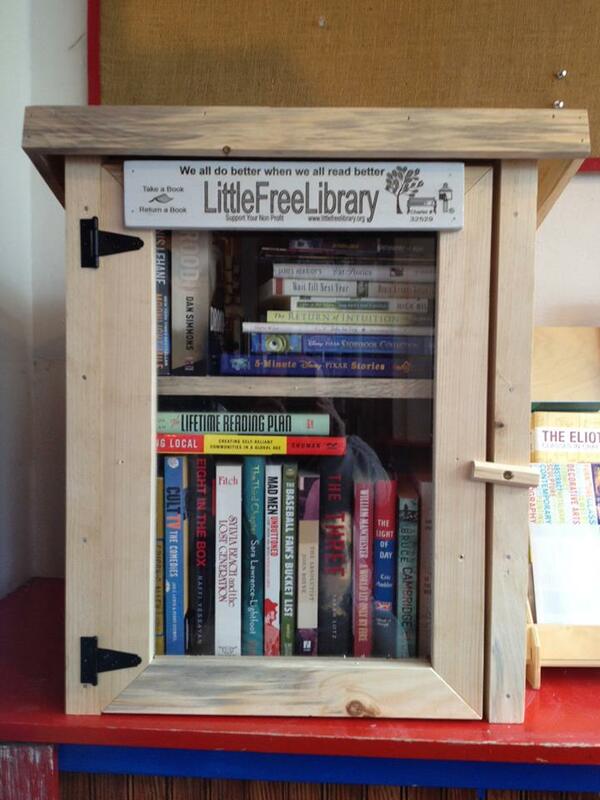 I love the Little Free Library movement–I wonder if I could do one here . . .